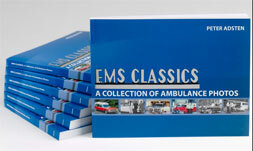 EMSClassics.com is offering the following book for sale, "EMS Classics - A Collection of Ambulance Photos". This book is an eclectic collection of old photos of ambulances of various makes and types, together with a bit of historic information and my own personal observations. Some photos are black and white, others are colour; some are professional photographer quality, others definately not. Most of the photos are from Canada and the United States; a few are from other countries. Some photos feature restored ambulances. Most of the photos present ambulances when they were still 'working'. A few of the photos have been previously featured in other professional car publications; however most are published here for the first time. If you are fond of classic ambulances I am certain you will enjoy this book! 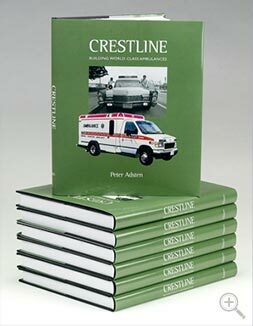 EMSClassics.com is offering the following book for sale, "Crestline - Building World Class Ambulances". This is a hardcover book, 360 pages, 560 photos (most of them color). The first chapter begins in 1967 when I worked for ambulance services in Saskatoon and Calgary. The following chapters chronicle the start and growth of Crestline Coach, our ambulance manufacturing company in Saskatoon, during the years 1975 to 2004. Also included are chapters on our other ambulance and bus supply companies: Ambucraft in Edmonton, Alberta; Dynamic in Langley, British Columbia and Novacentre in Boucherville, Quebec. Many of the photos in the book show customers with their new Crestline ambulance, paratransit bus or other specialty vehicle. If you are interested in ambulances, I am certain you will enjoy this book which illustrates the evolution of van and truck chassis ambulances. 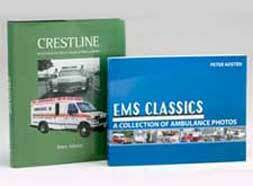 EMSClassics.com is offering one of each book: "Crestline - Building World Class Ambulances" and "EMS Classics - A Collection of Ambulance Photos". I was born and raised on a farm at Hague, Saskatchewan. After high school I worked at Ray's Ambulance in Saskatoon, then Universal Ambulance in Calgary, and then started Crescent Ambulance Service in Saskatoon in partnership with Ken Sawatsky. In 1975 Ken and I founded Crestline Coach and together with business partner Ronn Janzen operated the company until 2004. I am now retired and spend my time doing volunteer work at the Western Development Museum; searching for old ambulance photos in archives across Canada; and writing books and articles about Canadian ambulance history.